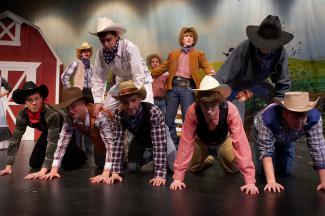 Congratulations to the cast and crew of Becker High School's successful four-day performance run of "Oklahoma!" Great job everyone! Peformance and group photos go online Monday Dec. 7 through Saturday, Dec. 19. Go to "online orders." For the password or other information about ordering photos, contact us by phone at 763-263-6974 or e-mail at clphoto@izoom.net. Orders received before Dec. 19 will be delivered to students at school the following week.